Michael McFadyen's Scuba Diving - Suzies Bommie Among the more experienced diver and especially among underwater photographers, Papua New Guinea is probably the world's number one dive location. The quality of diving in this remote and ancient country is unsurpassed. Not only are there the shipwrecks and aircraft of World War II to explore, there are dive sites all over the country that have fishlife that divers normally only dream about. One of these sites is Suzies Bommie. Unlike most of the other famous sites in PNG, this one is located within sight of the centre of the country's capital city, Port Moresby. 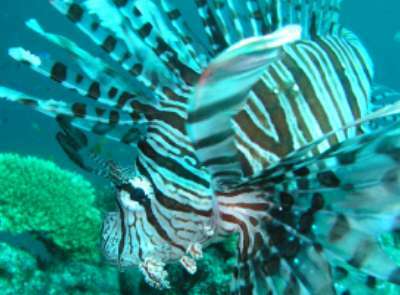 Port Moresby has a lot of excellent diving right on its door step and some even better diving only a short distance away. Suzies Bommie is located a short distance to the south-east of the city at Bootless Bay. From the wharf it is a relaxing hour run in the Dive Centre's boat almost 12 kilometres to the outside of barrier reef that runs parallel to the coastline along the whole section of coast around Port Moresby. It is a shorter distance and run (in a faster boat) from Loloata Island Resort. The dive site is located on the outside of the reef, west of Padana Nahua Passage, the main entrance to Bootless Bay from the open ocean. This is roughly due south of Loloata Island. The dive site is located at 9° 34' 53"S 147° 15' 32"E (using WGS84). There is a mooring at the site, located just under the surface. Once you descend to the bottom, you swim over the edge of the wall. The depth on the top of the wall is six metres and it drops to 15 metres. From here you swim off the main wall (which runs east-west) and out to the bommie. It is about 25 metres from the wall to the bommie and in clear water, you should be able to see the bommie before you leave the wall. The depth in between the bommie and wall is about 30 metres. The bommie itself is about 40 x 40 metres at the bottom and 20 x 20 metres on the top. The depth drops to over 45 metres on the southern side. Once you reach the bommie you can drop down as deep as you like and do a circumnavigation of the bottom section. The bommie has lots of gorgonias, hard and soft corals and other fixed marine life. The site has the most amazing fishlife. As you swim around, look for the giant morays (this is the common name and also refers to the size) that are hidden in among the corals. You will also see the occasional barramundi cod as well as a number of huge estuary cods. There are many long-finned, masked and short-finned bannerfish hanging around the gorgonias. 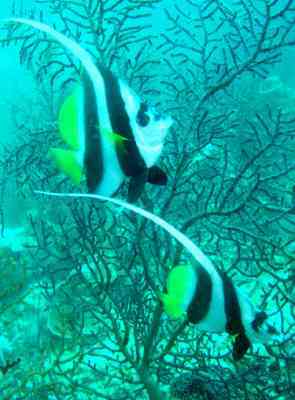 There are also some moorish idols and many species of anthias. As you circle the bommie, come up a bit as you go. It is easy to stay outside decompression on this dive, just keep ascending as you go. There are a number of very large humpheaded wrasse that dart in and out of visibility. There are lots of firefish on this dive. I saw one group of five red firefish and another group of eight. There were others as well. As you get near the top of the reef and closer to the outer edge, the fishlife increases dramatically. Huge schools of surgeonfish (many species), mangrove jacks, black and white snapper and trevally move around the reef top. 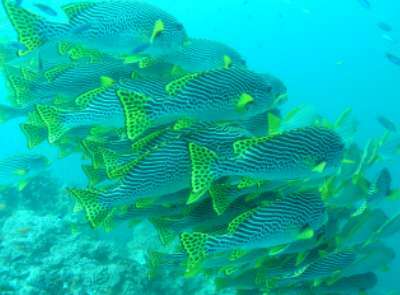 As well as these fish, there are large numbers of diagonal-banded sweetlips and some harlequin sweetlips. The diagonal-banded sweetlips are particularly spectacular, as they are large in number and large in size. The top of the bommie is also home to quite a few anemomes and clownfish and there are some large porqupinefish and batfish. There was a slight current on this dive (incoming as the tide was running in) but it was never a problem. The current, of course, contributed to the spectacular number of fish we saw. Visibility was very good, perhaps 20 metres. Water temperature was 26.7°C. This is a must do dive if you are staying at Loloata Island Resort or if you are diving with the Dive Centre. An amazing dive site.